All is not well in British baking. Commercial bread is laced with additives to make it look good and stay soft. It uses varieties of wheat that have been bred for high yield and baking performance with little concern for human nutrition. To rush it through the bakery at the lowest possible cost, it's dosed with four times as much yeast as before. Described as 'fresh' when it may have been frozen and re-heated, it's sold as a loss-leader at knock-down prices which undermine what little respect it may once have commanded. Even before the Atkins diet frightened people off, there was evidence of a massive growth of intolerance -- to gluten, wheat and yeast in particular. Call it coincidence. Dismiss it as hypochondria if you will. But things have come to a pretty pass when people avoid their staple food -- the staff of life -- in droves. 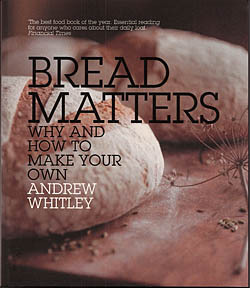 'Bread Matters' offers a solution.Revealing the madness behind this modern adulteration of our most basic food as only an insider can, organic baker Andrew Whitley, founder of The Village Bakery in Melmerby, shows why and how to make real bread at home.Unlike many bread book authors, he has baked for a living for over 25 years. His recipes are fool-proof because he explains what's really going on, demystifying the science, sharing a practical baker's craft. Using the skills he deploys on his popular courses, he guides and inspires beginners and seasoned bakers alike. And he brings good news to those who have had to abandon bread because of dietary sensitivity, showing how to bake tasty and nutritious food without yeast, wheat or gluten.